Work, home, even in the car, stress is a constant struggle for many people. But it's more than just exhausting and annoying. Unmanaged stress can lead to serious health conditions such as high blood pressure, heart disease, obesity and diabetes. "The North American lifestyle is fast-paced and productive, but can be extremely stressful. If that stress it not addressed, our bodies and minds can suffer," said Dr. Aaron Michelfelder, professor of family medicine at Loyola University Chicago Stritch School of Medicine. Our bodies need sleep to rejuvenate and if we are uptight and stressed we aren't able to get the rest we need. This can lead to serious physical and mental health issues, which is why it's extremely important to wind down, both body and mind, after a stressful day. According to Michelfelder, one of best ways to wind down and reconnect after a stressful day is by taking a walk. Though any walking is good, walking in the woods or in nature has been proven to be even better at reducing stress and improving your health. "When we get to nature, our health improves," Michelfelder said. "Our stress hormones rise all day long in our bloodstream and taking even a few moments while walking to reconnect with our inner thoughts and to check in with our body will lower those damaging stress hormones. Walking with our family or friends is also a great way to lower our blood pressure and make us happier." Research out of Japan shows that walking in the woods also may play a role in fighting cancer. Plants emit a chemical called phytoncides that protects them from rotting and insects. When people breathe it in, there is an increase in the level of "natural killer" cells, which are part of a person's immune response to cancer. "When we walk in a forest or park, our levels of white blood cells increase and it also lowers our pulse rate, blood pressure and level of the stress hormone cortisol," Michelfelder said. He also suggests reading, writing, meditating or reflecting to help calm the mind after a long day. To help calm the body yoga and breathing exercises also are good. "If you want to wind down, stay away from electronic screens as they activate the mind. Electronic devices stimulate brain activity and someone's post on Facebook or a story on the evening news might cause more stress," Michelfeder said. 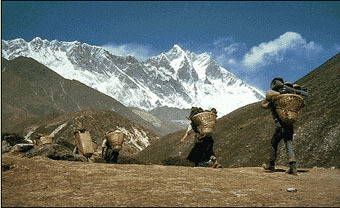 The Sherpa population in Tibet is world-renowned for their extraordinary high-altitude fitness, as most famously demonstrated by Tenzing Norgay's ability to conquer Mount Everest alongside Sir Edmund Hillary. The genetic adaptation behind this fitness has been a topic of hot debate in human evolution, with recent full genome sequencing efforts completed to look for candidate genes necessary for low oxygen adaptation. However, few have looked at the Sherpa population by sequencing their mitochondrial genomes -- the powerhouse of every cell that helps determine the degree of respiratory fitness by providing 90 percent of the human body's energy demand, as well as controlling the metabolic rate and use of oxygen. Unlike genomic DNA, the mitochondrial genome is unique inherited only through the mother, is small in size, and has a high mutation rate. Researchers Longli Kang, Li Jin et al. have sequenced 76 Sherpa individuals' complete mitochondrial genomes living in Zhangmu Town, Tibet, and found two mutations that were specific to the Sherpa population. The authors suggest that variants for one recent mutation in particular that was introduced into the Sherpa population about 1,500 years ago, A4e3a, that may be an important adaptation for low oxygen environments, or hypoxic conditions. This mutation is found in an "entry enzyme" stage in the mitochondrial respiratory complex, which may explain the importance of the role of mitochondria in the Sherpa population's ability to adapt to the extreme Himalayan environment. The authors also shed light on the demographic history of Sherpa population size over evolutionary time, showing a significant expansion from 3,000 to 23,000 around 50,000 years ago, followed by a very recent bottleneck in the past several hundred years that reduced the population from 10,000 to 2,400, matching known historical migration patterns. The above story is based on materials provided by Molecular Biology and Evolution, via EurekAlert!, a service of AAAS.